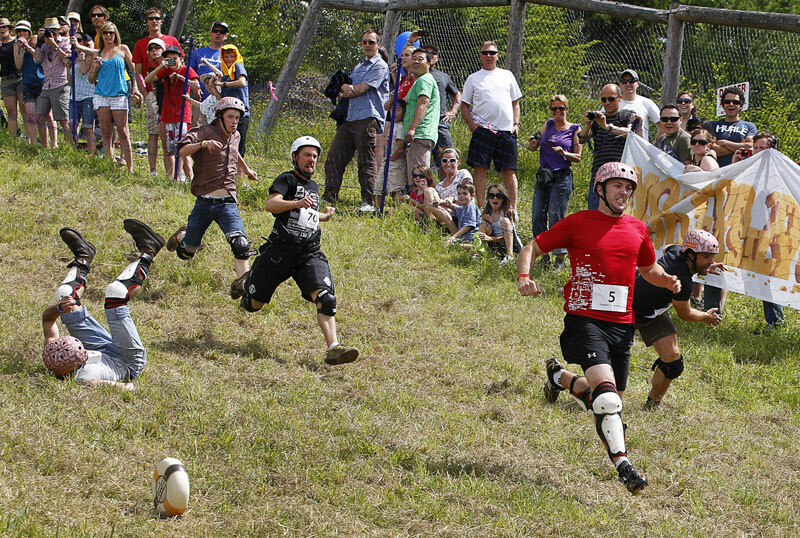 The rolling cheese eludes chasers as they run, stumble and fall during a championship heat. Chasing a giant wheel of Canadian cheese down Blackcomb Mountain in Whistler, British Columbia, is how 165 enthusiastic competitors spent last Sunday afternoon during the annual Canadian Cheese Rolling Festival sponsored by Dairy Farmers of Canada. The two Grand Champions each went home with an 11-pound wheel of Canadian cheese and a Whistler season’s ski pass for two. The male Grand Champion, Guy McLintock of Vancouver, British Columbia, won the men’s race in a time of nine seconds and the female Grand Champion, Lorraine Phan of Richmond, British Columbia, won the women’s race in a time of 19 seconds. In addition to the men’s and women’s downhill races, 139 children participated in uphill races. More than 12,500 spectators took in a host of fun activities including Cheese Twister, free cheese seminars and a cheese market full of delicious samples of Canadian cheese made from 100% Canadian milk. Grand Champions Guy McLintock and Lorraine Phan with their wheels of Verdelait. Renowned Canadian and award-winning stand-up comic, improviser, actor and writer from Western Canada, Roman Danylo, hosted the days’ festivities, which involved 11 race heats before the final Grand Championship races. For the fourth consecutive year, Brisitsh Columbia cheesemaker Natural Pastures produced the special 11-pound wheels of delicious Cracked Pepper Verdelait for the Canadian Cheese Rolling Festival. Verdelait is the delicious, award-winning blend of cheddar, Dutch gouda and Swiss raclette, developed by Natural Pastures in Courtenay on Vancouver Island. Verdelait is the base for the five flavoured cheeses. Versatile and wonderful for cooking, grating, fondues, sandwiches, it melts beautifully.